In case you haven’t been following the bitter feud between the two tech giants, let me fill you in. 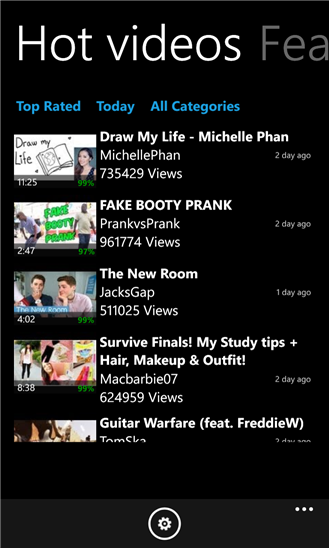 Like any large mobile platform, Windows Phone required an official YouTube app. Microsoft created one, but was just a portal to the web version of YouTube. In a few months, a new app was released which offered much more functionality than even the Google made YouTube apps on Android and iOS, which included the ability to download videos and no ads. Google, miffed by the breach in policy, asked Microsoft to take down the app or update it according to their terms. The next update removed the download option, but still didn’t have ads. After claims of “working together”, ads were implemented and the download option remained inactive, yet Google blocked the app because it didn’t “meet their terms of service” and “didn’t implement ads correctly”. Microsoft claims that they’re being forced to create an app in HTML5, which isn’t possible without compromising on the experience, and also unfair because both the officially made Android and iOS apps run on native code instead. Now, the YouTube app remained on the market, but was unusable due to Google blocking it. The tussle has now finally come to an end and it looks like Google isn’t cooperating with Microsoft as originally claimed. The app has reverted to its earlier state of being just a link to the mobile website, which is an unfortunate blow to Windows Phone users. Google claims breaches in terms of service, and Microsoft claims unfair demands, it’s hard to say who’s in the wrong, but customers are definitely getting inconvenienced either way. So what’s the alternative you ask? There’s quite a lot of third party YouTube apps on the App Store, and we tell you the top 4 that will satisfy your web video cravings on your Windows Phone! 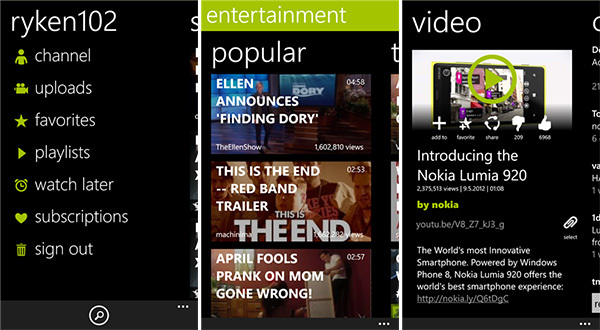 One of the first apps to really provide full YouTube functionality to Windows Phone 8 users, MetroTube remains one of the best choices even today. It’s fast, easy to use, has a great UI and lets you do much more than just watch videos in an app interface. It supports live tiles, fast resume, and even lets you “preload” videos for watching later, which can also be pinned for quick access. Plus, it can be used as a default player, and can be made to launch even from other apps. myTube is a relatively new app, but can certainly give any other unoffical YouTube app for Windows Phone 8 a run for its money. It supports user accounts, favorites, has videos categorized neatly and the UI is swanky too. But what really sets it apart is the ability to keep playing videos in the background. 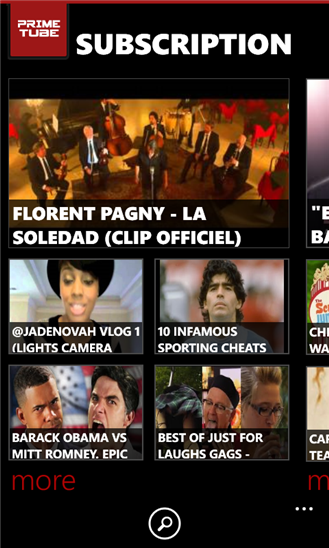 Basically, you can play a video and still look for more videos without interrupting the video being played. Very nifty! 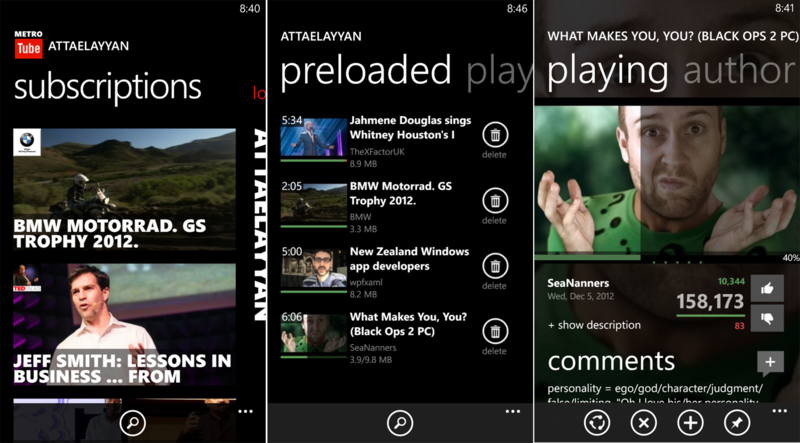 PrimeTube is a completely free YouTube app for Windows Phone 8 that lets you subscribe to channels, like/dislike videos, create playlists, pin videos/channels/users to the Start screen and much more. It doesn’t come with download support, but as a YouTube client, it has everything you’ll need. Plus, the best part is that it’s completely ad free, and doesn’t require you to pay a cent! YouTube HD might not have the best looking UI of the bunch, but it more than makes up for it in the features department. Other than the usual subscriptions, channel, user and commenting support, YouTube HD features almost full offline capability. You can download videos for watching later, and can even upload recorded videos directly through the app. It’s completely free as well.